The following article was sent to us by an ANN reader. It was written by Bill Lavender, and was posted on his website. It appears here in its entirety with Mr. Lavender's permission. 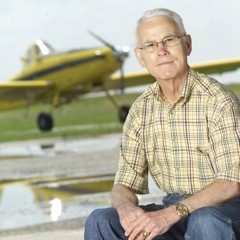 Leland Snow, founder and President of Air Tractor, Inc., and the inventor of modern aerial spray aircraft, died Sunday morning, February 20, 2011 while jogging near his home. He was 80 years old. Snow leaves behind a 53-year legacy of aircraft design and innovations that ushered in the era of the modern aerial spray plane. Air Tractor, the company he founded in 1972, produces the world's most popular aerial spray aircraft and single engine air tankers for aerial firefighting. The company's product line includes 400, 500, 600 800 and 1,000-gallon capacity aircraft powered by Pratt & Whitney piston or turbine engines. They are used for agricultural purposes, forest and wildfire fighting, narcotic crop eradication, fuel-hauling, fighting locust plagues, and cleaning up oil spills in coastal waters. Air Tractor aircraft are found working not only across the United States, but around the globe, in Canada, Mexico, Central and South America, North and South Africa, Australia, New Zealand, Spain, Italy, Croatia, Macedonia, Saudi Arabia and South Korea. Leland Snow designed his first aerial spray airplane, the S-1, in 1951. The 23-year old Snow completed test flights with the S-1 in 1953. Snow's S-1 flew dusting and spraying jobs in the Texas Rio Grande Valley and in Nicaragua until 1957. He followed-up the S-1 with the models S-2A and S-2B, which were built when Snow moved to production facilities in Olney, Texas in 1958.